JPC, Regent Samsic’s cleaning business in London has had its contract extended at White City’s former BBC Television Centre to include all common areas within the site’s new residential development. The contract extension was awarded by Broadgate Estates, the Property management group at the BBC’s landmark former HQ which is being re-developed into a mixed use development including office and studio space, complementary entertainment and leisure facilities, public open space, premium offices, housing, cinema, a members’ club and hotel. JPC has been delivering cleaning services on the estate, marketing suite and show homes for the past two years. JPC Operations Manager Sylwia De Sousa commented: “Maintaining a high standard of cleaning on a site under construction is a real challenge, but it’s so important, especially with prospect buyers visiting. Home to most of its national television and radio news output, Television Centre was the headquarters of BBC TV between 1960 and 2013. The complex was sold to developers Stanhope plc for around £200 million though the BBC will retain a continued presence at Television Centre through its commercial subsidiaries. The new development retains many features of the original buildings including the iconic ‘doughnut’-shaped commercial space, atomic dot wall and Helios statue. 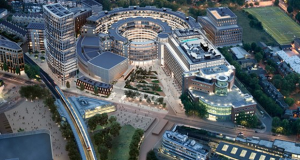 Construction at Television Centre, which will open to the public for the first time in its history, commenced in 2015 with 432 homes of 1,000 in total anticipated due for Phase 1 completion in 2018.